It may seem weird – maybe even unbelievable – but Bono has designed a trash can and wants YOU to buy it for charity. The unique bin is part of a new auction featuring a range of bins designed by celebrities and raising money for the Food Bank For New York City and the Chernobyl Children's Project International. 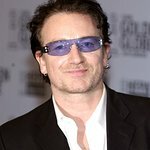 Joining Bono in designing the receptacles are a range of stars, including REM’s Michael Stipe, celebrity chef Mario Batali, models Helena Christensen and Christy Turlington, actress Mena Suvari, and many more. The auction is part of a partnership between The Conran Store – an international chain of homeware and furniture stores – and Danish design company VIPP, who were the original designers of the classic pedal trash bin in 1939. The unique celebrity designs will be on display for public viewing and pre-bidding at The Conran Shop in New York (407 East 59th Street) from September 4, culminating in a live auction event on Thursday, September 18, at the Winston Wächter Fine Art Gallery. For more information, or to see the creations online, visit the Conran Store website.